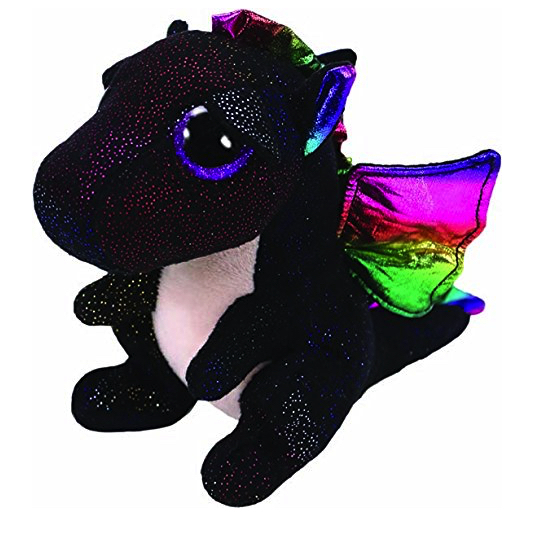 Anora is a black dragon covered in tiny iridescent flecks of silver. Her large button eyes are purple and glittery and she has a cream coloured belly. She has beautiful shiny rainbow coloured wings and the same material is used for her spine and the inside of her ears. Because my fur is really dark! Anora was released in January 2018. Her Birthday is 28th August. There are two versions of Anora. This is the 6″ Beanie Boo version. There also exists a larger 9″ variation.